Holy Prophet Muhammad (PBUH) used to fast repeatedly in the month of Shaban. Hazrat Aishah (RA) said: “I never saw the Messenger of Allah fast for a complete month except for Ramadan, and I never saw Him do more fasting in any month than He (SAW) did in the month of Shaban” (Al-Bukhari). The night of absolution or Shab-e-Baraat has its own significance in religion Islam. Shab-e-Baraat is the night of celebration or the night of freedom from Hell’s Fire. In another hadith Prophet (PBUH) aid related to the significance of the month of Shaban in these words: “People neglect this month which is between Rajab and Ramadan, in this month the actions of the people are presented to Allah; so, I like my deeds to be presented while I am fasting” (Abu Dawood). 15th of Shaban holds great importance in the life of Muslims. Holy Prophet Muhammad (SAW) described the significance of worship during midnight and fasting in the day in these words: “When the Middle Night of Shaban arrives, you should stand (Praying) in the night and should fast in the day following it”(Ibn Majah). We came to know from this hadith about the importance of fasting on the 15th of Shaban and worship during the night when Allah Almighty forgives whoever seeks forgiveness from Him. This night Shab-e-Barat should be spent in worship and total submission to Allah Almighty as much as possible. The recitation of the Noble Quran is another form of beneficial worship in this night. After performing Salah, or at any other time, one should recite as much of the Holy Quran as one can. The best benefit one can take from the blessings of this night is by asking Allah sincerely. It is hoped that all our prayers in this night will be accepted by Allah. Dua itself is a form of worship and Allah Almighty rewards those who recites for asking in addition to fulfilling their needs. The Holy Month of Shaban for different reasons holds great importance in the Islamic calendar. The month of Shaban links up to the blessed month of Ramadan which is why the Holy Prophet (PBUH) loved it so much. 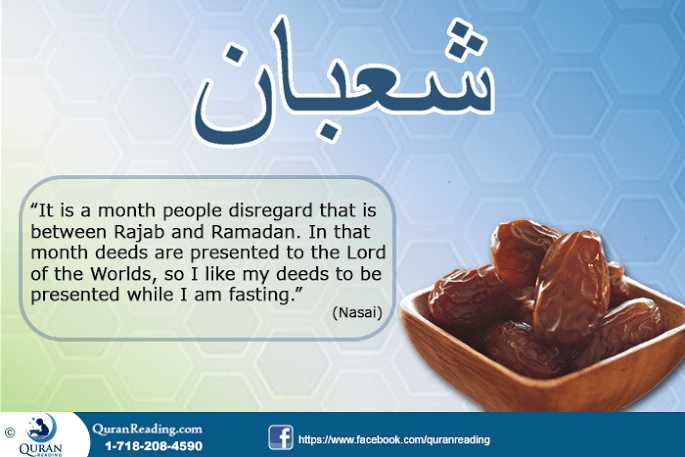 In the Holy Month of Shaban Muslims gear up and prepare themselves for the month of fasting to come. May Almighty Allah give us the ability to fast abundantly in this month and committing good deeds to receive pardon and forgiveness. Ameen!